[dropcap type=”3″]A[/dropcap]ubergines are one of the most unappreciated vegetables and quite often are part of the “don’t-know-how-to-cook-it” list of foods. Tell your friends, for, example, that yestreday you cooked a recipe using them and the questions will come flushing in about whether they tasted good enough (most people have the impression that they taste awful or weird) or how difficult was it to cook them and so on and so forth. Yet, aubergines are not like that at all. There are one of the most impressive, glossy looking vegetables and even though they may seem intimidating the first time you try to cook them, it is really worth picking them out of the shelf for their taste and versatility. 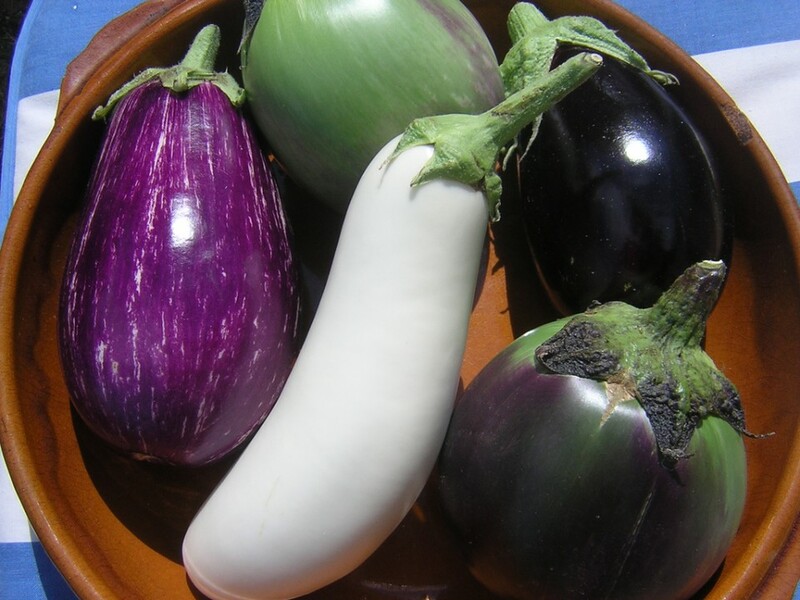 Aubergines are well-known for their deep purple, exterior even though they can also be found in white and green color. Their outer, shiny armor protects their meaty, precious heart. Even though we refer to it as a vegetable, it is actually a fruit and more specifically a berry. When they first came to Europe from the Eastern Asia they produced great speculation because of their odd appearance and because they were a member of the Nightshade family of vegetables which includes poisonous plants. Nowadays, aubergines still struggle to receive the recognition of other vegetables. Even though they are extremely versatile and can be a great alternative for many meat dishes, people lack the awareness of how to use them in order to produce great recipes. Today’s urban legend has it that aubergines are very difficult to prepare, they are bitter, they absorb too much oil while cooking, and they do not taste interestingly enough. But that is completely untrue. Aubergines grown today are no longer bitter. They are a low-calorie, zero-cholesterol, non-fat, zero-sodium food and grilling them instead of frying them will add a charcoal taste that is truly amazing. 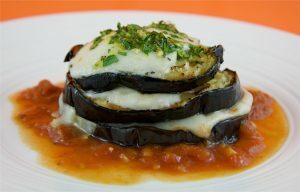 Aubergines love to be grilled, to be transformed into a velvety puree. They eager to be covered in hot red sauce topped with feta cheese. They thrive when they are glazed with olive oil. They are the perfect partners to potatoes and together they can produce a truly amazing and mouth watering vegetarian Indian curry or a tasty Greek mousaka. They dance in perfect harmony with garlic. They can easily stand alone as a main dish or they can easily accompany almost all dishes as part of a warm salad, dressed in sweet balsamic vinaigrette. I cannot help but remember my first personal encounter with an almost “vinyl” looking, purple aubergine. The moment I laid my eyes on it I knew I had to buy it. I didn’t think what I was going to do with it; I just knew I had to have it. So I took home with me one beautiful, fresh, firm aubergine. When I got home I was ecstatic with my purchase. I could look at it for hours; and so I did because by that time I realized I didn’t know what else to do with it but admire it. I called my mom up to ask for immediate help as I was starting to get frustrated; I had to find a recipe to cook to do its perfect appearance a justice. She gave me a number of great recipes but all were too complicated. I hang up and continued staring at her (by that time the aubergine was a “she” and was thinking of even naming her!). And then it hit me. What is the easiest thing to cook with a minimum of ingredients? Pizza; and so I prepared aubergine mini pizzas. The result was spectacular and ready in no-time. To see it for yourself, go ahead and cook them and you will be amazed! So, put aside all your fears and predisposition, get inspired by their perfect glossy appearance and give them a try. You will soon realize that they are no longer the “Mad Apples” of history but instead the new “Apples of Love” of home cooking.